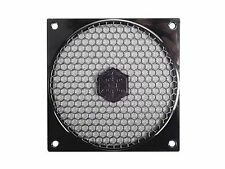 NEW Cuttable Computer Mest140mm PC Fan Dust Filter Dustproof Anti-Dust Case . 1pc of this small High Performance 25mm FAN 5Vdc details below. In this “Buy it now” you will get 1pc of this Commonwealth Fan as above. Fan 25 x 25 x 10 mm 5Volts DC. Bearings: Ball. Leads: 300mm AWG#24. 1pc of this small High Performance 30mm FAN 12Vdc details below. In this “Buy it now” you will get 1pc of this Commonwealth Fan as above. Fan 30 x 30 x 10 mm 12Volts DC. Bearings: Ball. Noise: 28 dB. Leads: 300mm AWG#24. Available in 8cm & 12cm (80mm or 120mm). Guard Grill for PC Case Fans. Double Dust Network Filter Protector Cover. Protects your internal components from dust and debris! 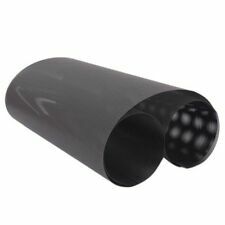 - Thermal Grease Paste & Thermal Plaster Glue -. External Width 120mm x 120mm. 120mm PC case fan Guard. 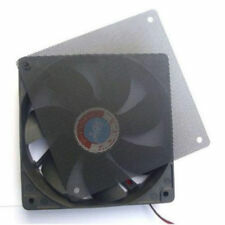 Fan Size 120mm. 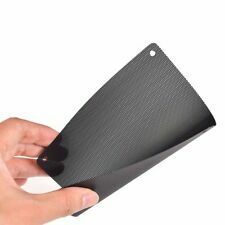 In this “Buy it now” you will get - Fan Guard 120mm Black x 2pcs. This beautifully designed fan grill improves every fan's appearance. Aluminium Filter is Super durable and easy to clean. This item could help to keep your PC and PC components clean, minimize the noise from the fan and extend the life-span of your fan. Protector Guard Grill for PC Case Fan. Genuine ixon dust cover for CPU. Great for keeping dust out and also protecting from static High quality product. Please do not confuse with cheap quality. 580mm X 216mm X 457 mm Item sent unboxed. Item will me sent out next day using 2nd class delivery. Easy to fit. 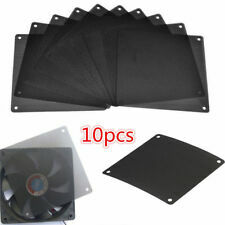 Application PC case fan filters. Product Code GRM120-AL01-BK. Colour Black. Available size 12cm. Colour: Black. Fan: 80mm x 80mm x 25mm. In this “Buy it now” you will get 1pc of this Fan. Bearing: Ball. Max Air flow: 40 CFM. Leads: Wire Leads AWG#24 Red Black 300mm long. Speed: 3200rpm. Easy to fit. 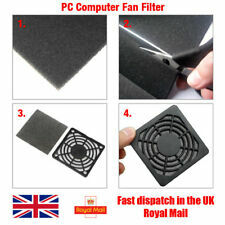 Application PC case fan filters. Product Code GRM140-AL01-BK. Colour Black. Available size 12cm. Colour: Black. Computer fans are essential for any computer, whether it is because you are looking to replace your current one or to install one while building your PC. Fans are used to expel warm air from inside the computer and to cool down the machine. Generally, the most sought after fan size is 120mm, but computers vary and so it is important to check which size fan to buy. Fan sizes are measured and determined by the size of the fan fitting position in the frame of your computer. The available sizes are 40mm, 50mm, 60mm, 70mm, 80mm, 92mm and 120mm. Because it is possible for dust to be taken in by the fans, you are able to purchase fan covers to prevent this. 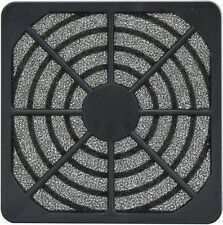 These help to keep your computer components clean, minimise noise made by the fans and ensure longer life of the parts. 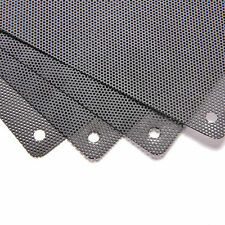 They can simply be attached to the front of a fan and to look similar to netting, so they are inconspicuous. 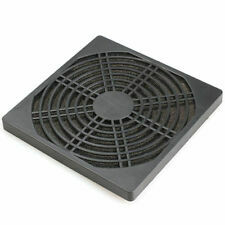 Additionally, it is possible to buy fan guards and grills. These also provide better noise control and performance of airflow in the fan itself. Fan grills and guards come in several different designs and patterns, all of which have their own strengths and weaknesses. 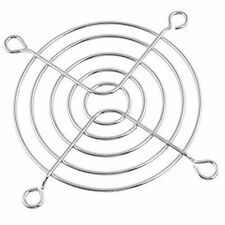 The most sought after grill is the traditional concentric circle, which is widely used for home and business use. If you are looking to give your computer more personality, fan grills and guards also come in various custom-made shapes by StarTech. Their designs include dragons, lions and spiders, which are all laser cut for a clean finish. Laptops exude heat from underneath, which is why it is generally best not to use a material surface underneath one when in use as it may overheat. A way to combat this for when you are using your laptop at a desk is to buy a cooling stand. Cooler Master stands have tessellated shapes cut out of the stand to allow for better airflow and is slightly raised to give the hot air somewhere to go.